HOLLYWOOD, Fla. - When Jack Michel was publicly questioned for the first time about the 14 residents of his Rehabilitation Center at Hollywood Hills nursing home who died in the aftermath of Hurricane Irma, he had nothing to say. “Why did they have to die, Jack?" Local 10 News investigative reporter Bob Norman said. Michel apologized for his failure to answer Norman's questions about the tragedy that occurred after a power outage during the storm that caused a longstanding air-conditioning outage. Some of those who died had body temperatures of 106 degrees and more, according to Memorial Regional Hospital officials. A massive criminal investigation is underway, but there are many more questions about Michel himself, whose nursing homes have a history of numerous violations and low state ratings. "Jack, can you tell me about the fraud allegations?" Norman asked Michel. 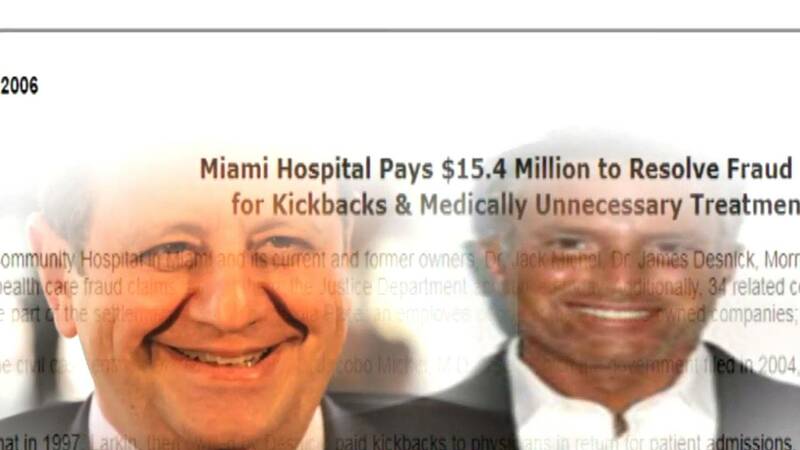 The U.S. Justice Department hit Michel with civil Medicare fraud charges in 2004, alleging he received $70,000 each month in kickbacks to funnel nursing home patients into Larkin Community Hospital in South Miami for medically unnecessary procedures. Authorities claimed Michel initiated the fraud with Larkin rep during a meeting in which he said, "Ask your boss if he would pay $1 million to make $5 million." 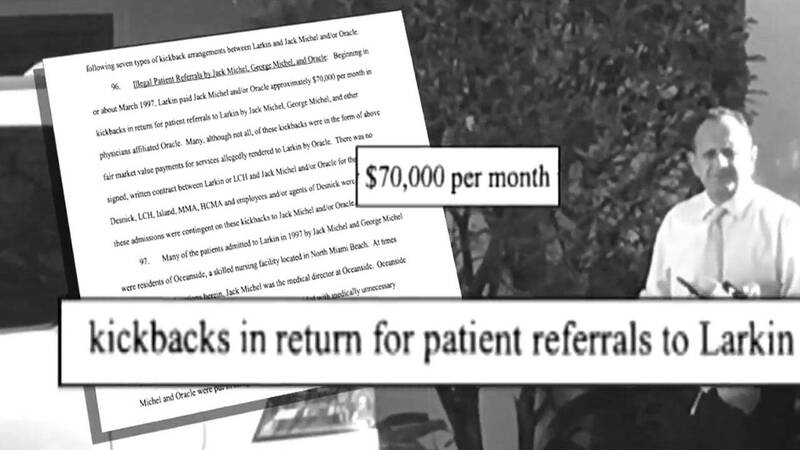 Michel eventually purchased the Larkin hospital (beginning with what the feds alleged appeared to be sham transactions) and, according to the complaint, began paying to other doctors for more bogus Medicare referrals. "So kickbacks beget kickbacks," state Sen. Gary Farmer, D-Fort Lauderdale, said. Farmer says the fraud described in the Michel complaint has become all too common. "These skilled nursing facilities have really become death warehouses," Farmer said. "Our elderly patients are being treated as cash crops." Michel and his business partners -- including Chicago Rabbi Morris Esformes and his son, Philip -- paid $15.4 million to settle the fraud case while admitting no wrongdoing. 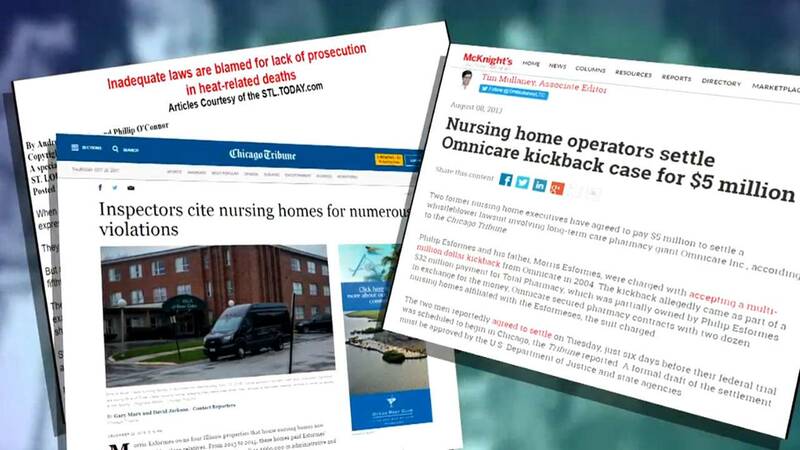 Published reports show that the Esformeses have a long history of nursing home violations going back decades in Chicago and other cities, including one case in 2001 involving the deaths of four women during a heat wave in St. Louis. Criminal investigations netted no charges in that case, but the nursing home was hit with a $275,000 civil judgment in one suit while three others ended with undisclosed settlements. But after paying the $15.4 million settlement to the federal government, both Michel and the Esformeses simply continued in the business of running nursing homes and hospitals. 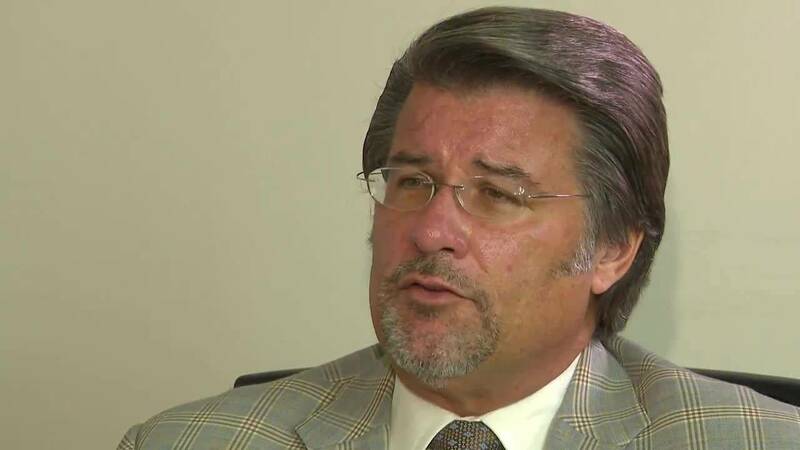 UPDATE: Morris Esformes' attorney, Harvey Tettlebaum said his client, despite the fact that he was named in the complaint and was part of the settlement, didn't pay any of the $15.4 million. Tettlebaum said a 2006 U.S. Justice Department press release that indicates otherwise is inaccurate. "They're allowed to go into business again," Farmer said. "It makes no sense." Attorney Bill Dean, who has filed numerous lawsuits against nursing homes owned by both Michel and the Esformeses, echoed Farmer's sentiments. "How does the state of Florida give Jack Michel a nursing home license when he's had a history of Medicare fraud? I have no idea," Dean said. When asked why the state allowed Michel to get his license to operate the Hollywood nursing home in 2014, Gov. Rick Scott had no answers. "I think the important thing is you've got to hold people accountable," Scott said, noting that the state shut down the facility after the deaths. "But are you going to keep people who have been accused of Medicare and Medicaid fraud from owning these facilities in the future?" Norman asked. "We're going to work with the Legislature, all right, to make sure that we hold everybody in the health care community accountable," Scott said. "But you're not going to stop them from owning them?" Norman said. "I'm going to hold people accountable," Scott said before walking to his waiting vehicle. In the case of Philip Esformes, the Justice Department alleges he picked up right where he left off after the 2004 civil fraud settlement, engaging in "essentially identical conduct" while masterminding a billion-dollar health care fraud utilizing more than 30 nursing homes in South Florida. Esformes is now in federal prison awaiting trial in what the feds allege is the largest criminal Medicare fraud case in U.S. history. "It's hard to teach an old dog new tricks," Farmer said. "We're working on legislation right now that would mandate that applications be denied when they're submitted by people we know have committed financial wrongs in the past," state Sen. Gary Farmer said. Michel wasn't charged in that case, but the feds allege Esformes sent many nursing home patients in the fraud scheme to Larkin, the hospital that Michel still owns, for unnecessary treatments. On top of that, Larkin's former director of outreach services, Odette Barcha, was indicted in the case for allegedly helping pull off the massive fraud. While Michel refused comment, his spokeswoman Alia Faraj-Johnson, said Michel stopped doing business with Esformes after paying the $15.4 million civil fraud settlement and said the use of Michel's hospital by Esformes was coincidental and Michel had no personal involvement whatsoever in the alleged fraud. One of Esformes' attorneys, Roy Black, said his client has pleaded not guilty and is expected to face trial in March. Farmer said he wants to make sure those who pay fraud settlements are banned from the nursing home business in the future. "We're working on legislation right now that would mandate that applications be denied when they're submitted by people we know have committed financial wrongs in the past," Farmer said. "I think it's common sense."